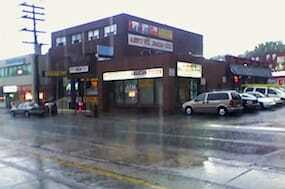 Michelle and I have been hanging around the Bathurst & St. Clair area quite a bit lately, (looking for an apartment). There’s a ton of great places to eat on St. Clair Avenue West from Bathurst all the way past Dufferin and I’ve written about some of them (Da Maria, Dutch Dreams, Pho St. Clair) in the past. Albert’s is a great place to get some Jamaican food take out – on the walls you’ll see photos of countless celebrities that have eaten there. They do have a few seats if you want to eat there but we’d always get it to go. Albert’s oxtail is great and Michelle says "you’ve never had Jamaican beef patties until you’ve had one at Albert’s." Yes, they are that good, and they are that much better than the ones you can buy in the subway. If you’re afraid to try the oxtail, don’t be – they have three different sizes so you can always order the smallest portion… The prices are very reasonable and edging on the cheap side. 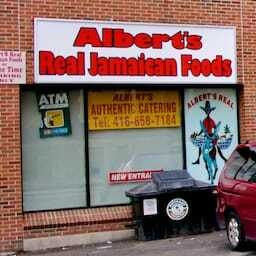 ;-) Many Jamaicans swear by Albert’s and it has gained the reputation of being one of the best, if not the best place for Jamaican food in Toronto. The service at Albert’s hasn’t changed much over the years – it’s painfully slow, emotionless, very transactional and definitely doesn’t give you warm feelings inspiring you to return. I’ll admit, saying it’s intimidating is a little bit of an exaggeration, but you get the idea. The food on the other hand, really is worth taking a subway ride all the way from Main & Danforth in the dead of winter. The spicy beef patty ($1.50) was very well made, had a nice texture overall and was noticeably fresh. The filling was smooth and full of flavor but it could have used a lot more spice/heat for my preference. The pastry was notably soft and not too thick nor chewy like the ones you find in the subway. For the most part though, while it was unquestionably an above average Jamaican meat patty, there was nothing very memorable nor shockingly exceptional about it. The Ox Tail Dinner ($11.50) was much spicier than the spicy meat patty, but not so spicy that it was unbearable. (Been there, done that.) The ox tail meat was packed with flavor, super tender and fell off the bone with little effort. Indeed, there are a lot of bones (it is ox tail after all), but there’s always a lot of meat on the bones at Albert’s and the portion is so large you definitely won’t leave hungry. The accompanying rice and peas are best described as awesome. Seriously, just the rice and peas alone would make anyone happy (and satisfied). I recently discovered that you can actually order just rice and peas with ox tail gravy for $5.75 – it comes in the same size container as the Ox Tail Dinner, packed solid with rice almost to the point of overflowing, (way more than enough for two people), and is topped with a generous helping of ox tail gravy that’s rich in shredded ox tail meat. So good! Unfortunately, the coleslaw that came with the Ox Tail Dinner was nowhere near the quality of the rest of the food. It was littered with a ton of black pepper specks (that’s what white pepper is for! ), but more offensive was the excessive sweetness – way too much sugar in there! I could also taste a lot of bitter/sharp cabbage stems, which is never what you want in a coleslaw. You can see from the photos that I still finished most of it anyways, so it’s not unpalatable, but next to the exceptionally good ox tail meat and the shockingly-good rice and peas, it’s very out of place. I do find myself missing the character of their old space, but the new layout is much more functional and makes a much better first impression. don’t be intimidated by Albert’s – the food is fresh, very delicious and super tasty! it’s affordably priced and you definitely won’t leave hungry. 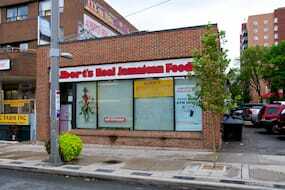 Albert’s Real Jamaican Foods was published on Friday, August 24, 2012 at 4:30pm EDT by Daniel Menjívar and last updated on April 11, 2018 at 9:30pm UTC .